Added option to Data columns to repeat data. This will show the same data on every page. Useful for showing things repeatedly like taxes, etc. What’s New in Studiometry 14.x? Why is 64-bit so awesome? What does 64-bit even mean? It basically means that Studiometry can now take advantage of the full processing power of your computer. If you’ve got a large Studiometry database, create complex summaries, or run your own Studiometry server, you’ll see a big increase in performance. 64-bit is “the way of the future” as they say. So get on board and buckle up! Type-A personalities rejoice! You can now schedule estimated work for specific employees and dates. 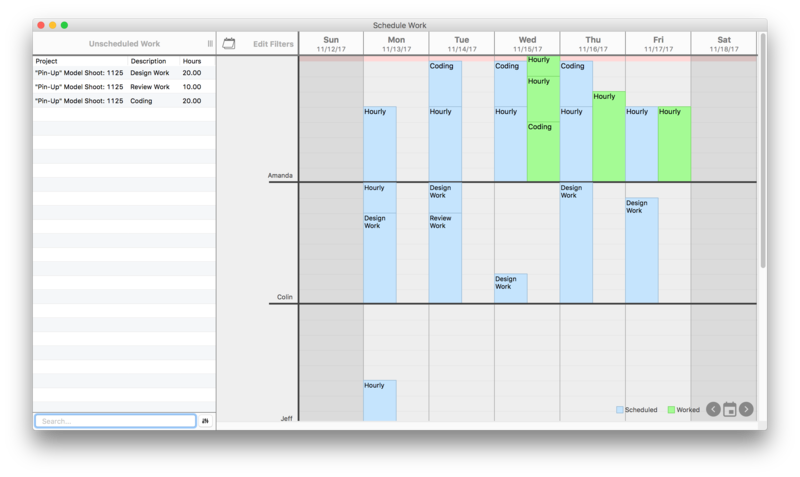 The new scheduling features give you a great visual representation of who’s doing what, and how much available time they have left each day. 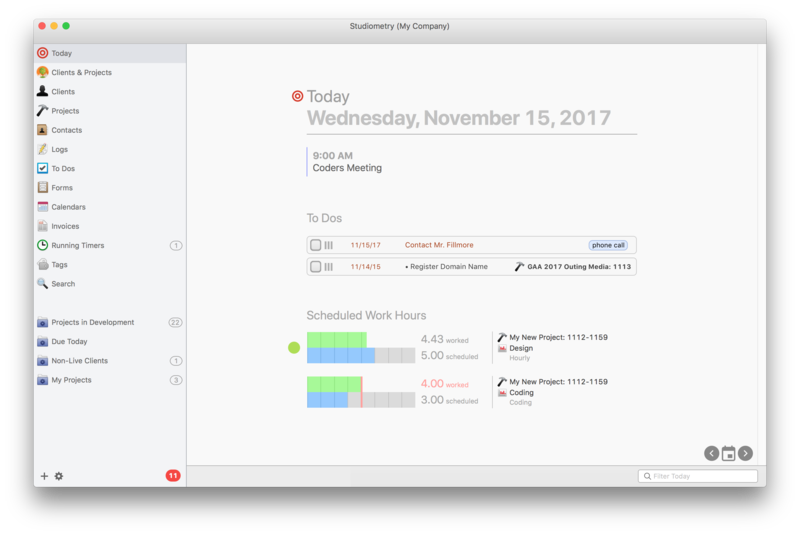 An easy and smart drag-and-drop interface lets you quickly schedule all of your estimated work. Everything that’s on your plate for the day, all in one place. See your calendar events and meetings. Mark To Dos as completed or easily postpone them until tomorrow. See your scheduled hours against which you can easily create timers or enter worked hours. The Today View gives you an interactive overview of what you should be doing for the day. We’ve made a ton of improvements to the invoice and report template editor. We’ve added rulers, grids, margins, snapping capabilities, and more. One of the biggest improvement is the ability to see previews of what’s in your Data Row areas, giving you a much better idea of what your generated invoices and reports will look like. Search functions and several other new features make it much easier and more enjoyable to make invoice templates. We’ve improved many of the functions related to Vendors and Purchase Orders. Purchase Orders can now be marked as paid and have a new “date paid” field. Custom Summaries, the incredibly powerful and customizable reporting features in Studiometry, can now be based on your Purchase Orders or Vendored Items. Several new bells and whistles have also been added for the Vendor views and exported reports. Studiometry 14 is available today for download and purchase. As always, new users and users of previous versions can take advantage of our free 30-day trial. Upgrades from Studiometry 13.x start at $59.95 USD per license, while upgrades from 12.x or older are $99 USD per license. Studiometry Cloud users can download and start using Studiometry 14 today without paying any upgrade fees.